Electro-Chemical Activation (ECA) is the generation of safe, effective, environmentally friendly disinfectants and cleaners by passing ordinary water containing dissolved sodium chloride through an electrolytic cell. Traditional electrolysis cells are only capable of generating small volumes of unstable, low pH oxidized water and the formation of hypochlorite (bleach). AQUAOX™ utilizes electrolytic cells where the anode chamber is separated by a unidirectional permeable membrane from the cathode chamber. This allows migration and separation of the ions to prevent the production of gaseous chlorine (CL2) while generating large volumes of neutral pH HOCL that is highly biocidal, but has a very low chemical load as compared to Sodium hypochlorite. AQUAOX™ generated HOCL is manufactured with validated devices and processes in accordance with EPA and ISO standards. Several parameters can be measured in order to establish the shelf life of HOCL. These include pH, ORP, EC, salinity and FAC (Free available chlorine). The FAC of most generated HOCL’s prove to be unstable and easily evaporates from the water causing an immediate, strong chlorine smell and complicating storage, transport and usage. AQUAOX™ produced HOCL is stable and ready to use for months. Log 6 reduction in less than 15 seconds. Effective against MRSA (Methicillin-resistant Staphylococcus aureaus), C. diff (Clostridium difficle), VRE (Vancomycin-resistant Enterococci) and acinetobactor baumannii. HOCL is not only a bactericide, but also a fungicide, sporicide and virucide. Micro-organism cannot develop resistance against HOCL, unlike traditional chemical agents. The free ions in HOCL rapidly react and denature proteins. HOCL should not be used on protein based products, since it will react and destroy the proteins. Once HOCL comes in contact with a microorganism, it attacks the bacterial proteins located in the cell membranes. The superiority of HOCL is in that it will eradicate similar antibiotic resistant strains including MRSA and VRE. Secondly, because of the osmolality difference (the conc. Of ion in the solution versus in the cytoplasm), HOCL will induce a rupture on the cell membrane leading to cell lysis. No evidence of toxicity in any form has been observed in any independent laboratory testing. 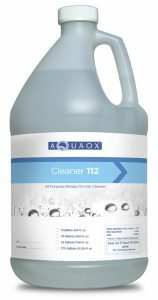 Based on all this information, it can reasonably be concluded that HOCL is non-toxic and safe to use in the industries and applications identified by AQUAOX™. Inability for Microorganisms to Develop Resistance. EPS Registered Hospital Disinfectant with natural fragrance. Log 4 reduction in less than 15 seconds. Effective against Pseudomonas aeruginosa, Salmonella enteric, Staphylococcus aureus, Swine influenza Virus (H1N1). Effective against VRE (Vancomycin resistant enterococci), Pseudomonas aeruginosa ATCC15442, Staphyloccus aureus (HA-MRSA) ATCC33591, Swine influenza Virus (H1N1) ATCCVR-333, Escherichia coli (NDM) ATCC BAA-2469, Human Immunodeficiency Virus Type 1 (HIV-1) Mn; ZeptoMetrix #0810027CF, Samonella enterica ATCC 10708. Not only a bactericide, but also a fungicide, sporicide and virucide. 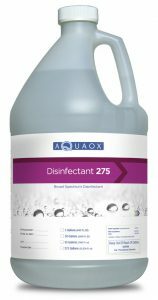 Cold, fast-acting, residue free non-toxic disinfectant. Micro-organism cannot develop resistancy against HOCL (Hypochlorous acid), unlike the case with chemicals (e.g. occurence of super bugs).